Since we're dallying at the science/art interface this week, here's some breaking news via AIP's Physics News Update: a group of Italian and German scientists have used nuclear magnetic resonance -- the underlying physics behind MRI machines -- to non-invasively map out the layers of historical fine paintings, and announced their results in the July 21 issue of Applied Physics Letters. Apparently this is known as "stratigraphy." Who knew? (Hint: not me! We live and we learn.) That includes any preparatory layers, under-drawings, the actual layers of paint, and in many cases, a layer of varnish. The rationale for doing this at all is that this sort of precise analysis helps establish age, origin and authenticity of works of art, in much the same as geologists learn about the Earth's history by studying the various geological strata. The new technique does much the same thing for paintings as it does for the human body, except instead of using x-rays, detectors, and cutting-edge computers to provide information about soft tissue and the possible presence of tumors, it provides information about the binding agents used in the painted layers. Those agents were often made of things like egg yolk or oil. How good is the technique? Well, just knowing the nature of the binding agent can usually distinguish between a naturally-aged painting and one that has been artificially aged (a polite euphemism for "forged"). It's non-invasive, and the magnet used in single-sided, unlike MRI magnets which have to surround the patient (and/or limb) for imaging. So scientists can bring the scanner right up to the painting without ever touching the surface. Ease of use counts for a lot when it comes to marketable applications! Furthermore, the technique can determine the thickness of various paint layers, too, and while it can't definitively "date" each layer, it can tell which ones are older than others. It's easy to see why this might be a useful tool for art historians. There's a strong tradition in science already of using x-ray imaging to study art, ancient manuscripts, even archaeological objects, although these don't penetrate to the same depths as the new MRI technique. I've blogged about that approach previously here. For about a year, scientists at the University of San Diego have been collaborating with an Italian engineer named Maurizio Seracini to analyze 500-year-old bricks from a wall in Florence's Palazzo Vecchio. About 30 years ago, Seracini noticed a cryptic message on another fresco in the hall by another 16th century artist, Giorgio Vasari: "Cerca, trova," or "Seek, and you shall find." (The image above is a scene from Vasari's fresco entitled "The Castration of Venus by Saturn." Truly an edifying image, or at least one guaranteed to strike the fear of god into the hearts of men.) This made him suspect that Vasari preserved Leonardo's unfinished fresco rather than destroying it. He also found bricks and stonework in a storeroom that were once part of the enormous hall, the Salone del Cinquecento ("Hall of the 1500s) in the Palazzo Vecchio. With the permission of Culture Minister Francesco Rutelli, he shipped off the bricks to UCSD so that scientists could analyze their structure and composition. Just a few years ago, they used radar and x-ray scans to locate a cavity behind Vasari's fresco, indicating a space between walls, and last November they used a laser scanner to construct a 3D model of Vasari's wall. Since then, they've been working on chemical analysis of Vasari's paint pigments, and thermal imaging to better delineate the wall structure. This will give them a better understanding of what might lie behind that wall in preparation for the final step: sending a flux of neutrons through the entire structure. Everything they've learned about the pigments and walls can be subtracted from the overall neutron analysis, thereby establishing the composition of the wall Leonardo worked on. If it's there, Seracini thinks the mural should be found right on top of the original stone wall of the hall. He could be wrong -- there might not be a lost Leonardo there at all. But at least art restoration can benefit from all these snazzy cutting-edge technologies. 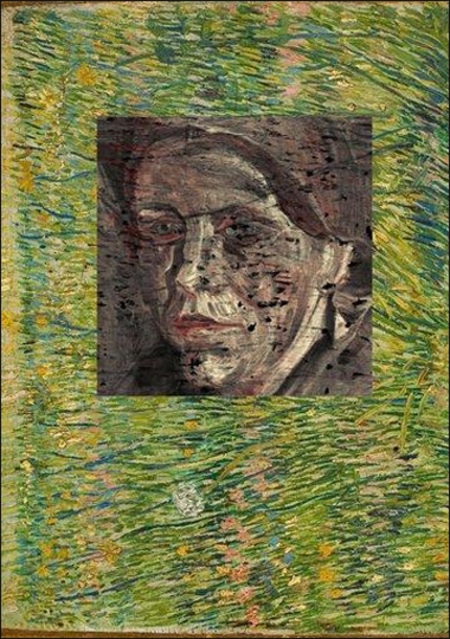 And just a couple of weeks ago that a team of European scientists have used synchrotron radiation to reconstruct the portrait of a peasant woman painted by Vincent van Gogh that the artist had then painted over when he created 1887's "Patch of Grass." It lay there, dormant, for 121 years until we finally had the technology to nondestructively analyze the painting and reproduce the hidden image. And we owe it all to the Deutches Elektronen-Synchrotron (mercifully known by the acronym DESY) in Hamburg, Germany. Synchrotron radiation is a bit different from conventional x-rays; it's a thin beam of very high-intensity x-rays generated within a particle accelerator. The Cliff's Notes version of how it works is this: You fire electrons into a linear accelerator (linac), boost their speeds in a small synchrotron and inject them into a storage ring, where they zoom through at near-light-speed. A series of magnets bend and focus the electrons, and in the process, they give off x-rays, which can then be focused down beamlines. This is useful for imaging purposes, and for analyzing structure, because in general, the shorter the wavelength used (and the higher the energy of the light), the finer the details one can image and/or analyze. Someone already used conventional x-rays to reveal the rough outlines of the underlying portrait, but that technique just wasn't sufficient to distinguish between the many layers of paint. Also, pigments made from heavy metals tended to obscure the colors derived from other elements, resulting in what Joris Dik, a materials scientist and art historian at the Technical University of Delft in the Netherlands, described as "a very partial, fragmentary, color-blind view." Dik and his colleagues took "Patch of Grass" to DESY and exposed the painting to the x-ray beams. The radiation excited the atoms on the canvas, which then emitted x-rays of their own, picked up a fluorescence detector. Each element in the painting had its own x-ray signature, so they were able to identify the distribution of metals in the many layers of paint, construct a 3D model, and then peel off the layers one by one in the virtual image until what lay beneath was finally revealed. Per the Los Angeles Times: "The top layer consisted of paints made with zinc, barium, sulfur, and other elements. Behind that they found a uniform distribution of lead, which was used as a primer to hide the portrait and prepare the canvas for a new painting. Once that was removed, they combined the distributions of two more elements -- mercury and antimony -- to produce the outlines of the hidden portrait." It's nice to see new uses emerging for the big machines of science -- especially when those new uses span across traditional disciplinary boundaries. Synchrotron light is a burgeoning research area, finding use in physics, chemistry, materials science, medicine, geological and environmental science, structural genomics, and (as we have seen) archaeology. No wonder various European countries are collaborating on building a brand-new fourth-generation synchrotron light source at DESY, called the X-Ray Free-Electron Laser (FXEL). Alas, the Synchrotron Radiation Source (SRS) based at the Daresbury Laboratory in Warrington, UK, was switched off earlier this week. But fear not! Its good work will continue at a shiny new facility: the Diamond synchrotron in Oxfordshire, part of a growing number of world-class research facilities in that area. In fact, scientists from the University of Cardiff have already developed a new technique for the Diamond synchrotron for analyzing the hidden content in ancient parchment without having to open them, such as the original musical scores of Bach, or the Dead Sea Scrolls (some of which are so fragile and badly damaged, they haven't been unrolled yet). Cardiff's Tim Weiss explained that many manuscripts, such as those in the 12th century, used iron gall ink made from oak apples, but the parchment on which they were written contains collagen (since the parchment was made from the thinly stretched skins of cows, sheep, or goats), and collagen naturally degrades to gelatin. Iron ink speeds up the process. It's a wonder so many parchments survived, frankly. Anyway, they're using the synchrotron's powerful x-ray beams, to create 3D images of iron-inked documents. Because the inked lettering contains iron, the result is an absorption image, much like how one's bones show up so vividly on a standard x-ray. Rolled parchment works the best with the technique; books are flat and thick, which is a bit more challenging. Apparently, per Weiss, "You really end up with a stencil rather than the lettering," in those cases. Isn't technology wonderful? I can't wait to see what else science finds lurking beneath the surfaces of other paintings and manuscripts. Art and science hand in hand. It's amazing what can be done. I can't help but wonder if van Gogh might be somewhat perturbed to know his older work was revealed..what I mean is, if I painted over something it would be because I was not so pleased with that particular work. At any rate, I'm sure he would be amazed at our scientific ability! I wondered about that myself; maybe it was something he never intended to outlive him. :) But now we're all about studying the "process" of the artist, so I guess it's relevant in that sense as well. This is very interesting information. It's neat how the development of new scientific tools can let us peer more effectively into our own culture, as well as into the universe as a whole. Speaking for myself, I've only ever obliterated a painting by painting over it once. However, even in posts about showing "making of" steps to a final piece, I edit which ones are too embarrassing to show. I'm sure most artists do the same. Sometimes, it's not about *making* a visually-pleasing picture, its about *picking* which one of your pieces pleases the most. And then along comes synchotron radiation to air the mediocrity. I wondered about that myself when I took a closer look at the title. no way Venus could be castrated :) Sometimes even Wikipedia is wrong.